The California State Lands Commission Final Environmental Impact Report is finished. 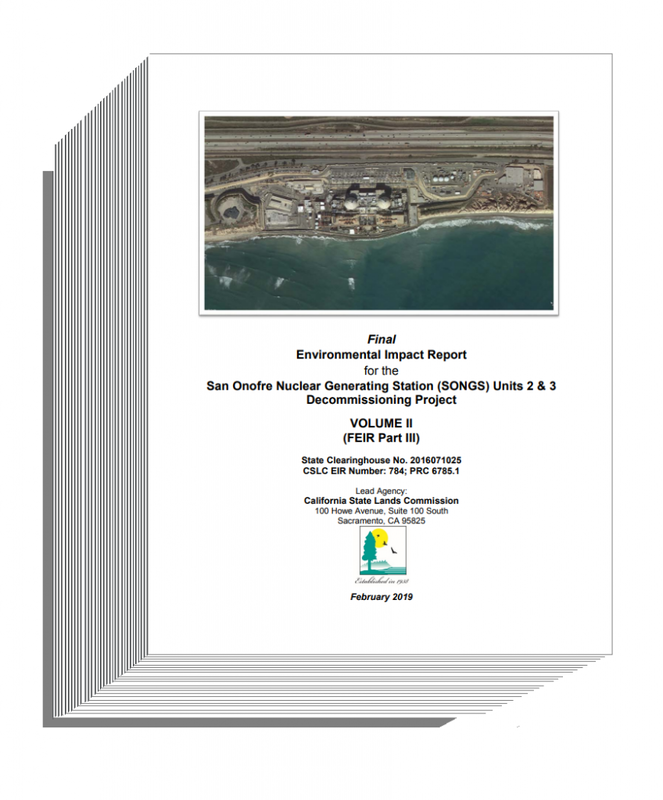 February 11, 2019, 4:50 PM — Today, the California State Lands Commission unleashed its “FEIR” (Final Environmental Impact Report) on the decommissioning of the San Onofre Nuclear Generating Station with a deadline for public comments of March 21, just 6 weeks away. The new “Part III” of this document is more than 750 pages. The public is only being given six weeks to review it. Southern California Edison had three years to prepare the original document. CLSC, the California State Lands Commission, hired expert consultants to help its large staff update the documents. It took CLSC more than six months to rewrite the final report. The record is silent on the subject of the dangerous safety accidents that have occurred at San Onofre. The CLSC was required to consider new information that it was unaware of in the crafting of the first two drafts. At San Onofre, there were two “unsecured load events” that the NRC described alternatively as “near-hits” and “near-misses” yet the report is silent on these safety lapses. But what is most unfair, is the short amount of time the public is being given to read and evaluate this report before the CLSC votes on it on March 21 in San Diego.